This is the view of the twin forts Guadalupe and Loreto from the French force marching to the Battle of Puebla on the fifth of May, 1862. 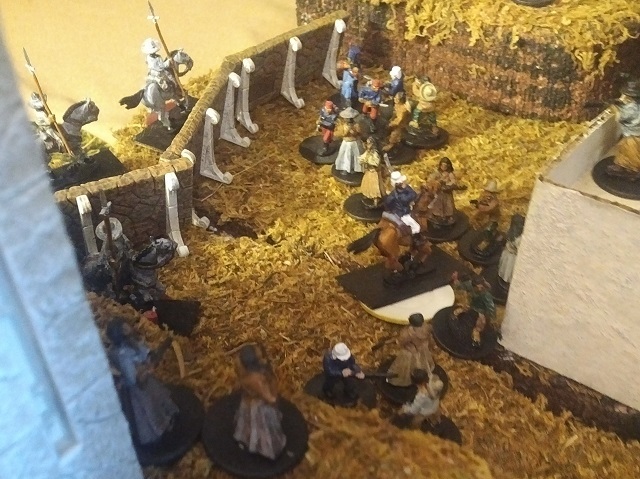 If you want spoilers, I wrote a (colloquial) summary of the battle at the bottom of the page. 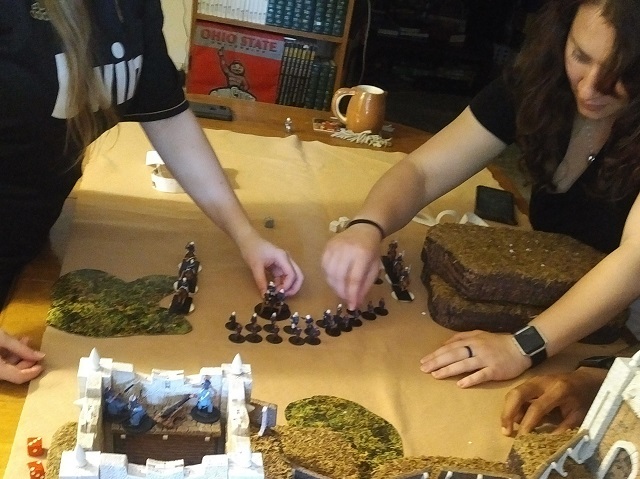 But for now, we're just going to give the battle report from the game we just played. Here are the French. 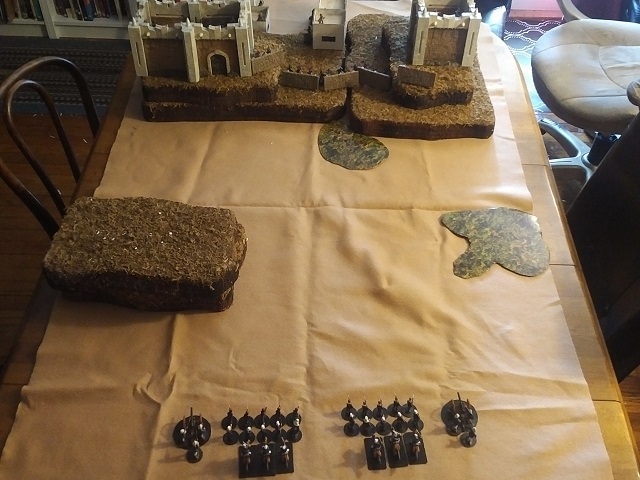 Pretty simple set up with a few (I have about three times as many) figures out for a short scenario of the final assault on Puebla. I'm happy to have the actual forces painted up now, since I have been fighting this battle for the past couple of years with proxies. Like the Battle of Cinco de Meiji, or the Battle of Cinco de Marso. 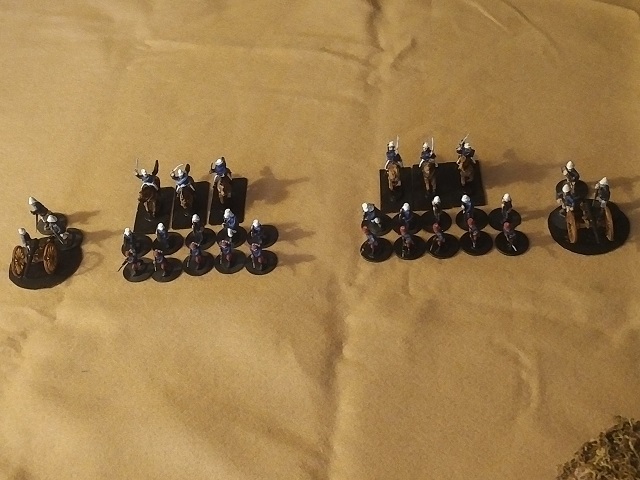 We have two flanks, each with ten infantry (five Zouaves and five regular French), three cavalry, and one artillery piece which required three figures to man it (otherwise, it's at degraded capability). Stats wise, the two types of infantry are identical (simple for a causal game today) with 50% hit and high Pk, given a hit. Likewise, the cavalry are fast (good warhorses) and brutal in close combat. And the artillery is devastating. But ... the artillery will lose a figure if they roll a six on attack. They can refill to get back up to full capability with any infantry unit. This represents the logistic deficency of the French artillery at this point. Now, the Mexican side. Again, happy to not have Martians or Japanese figures fighting the battle this year. 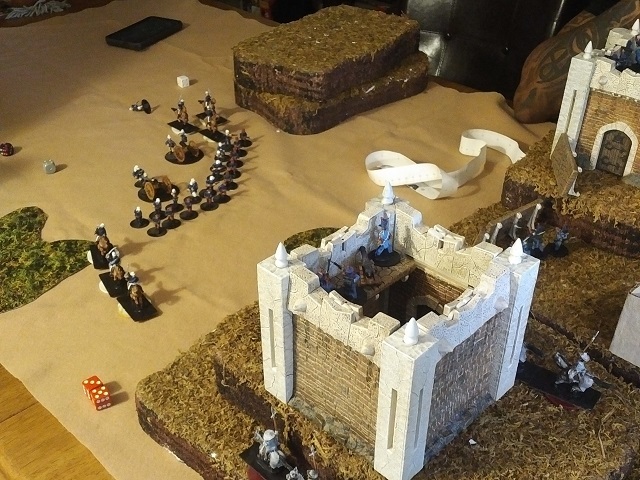 Maybe next year I can have some appropriate terrain (better than Mage Knight modular castles, at least). 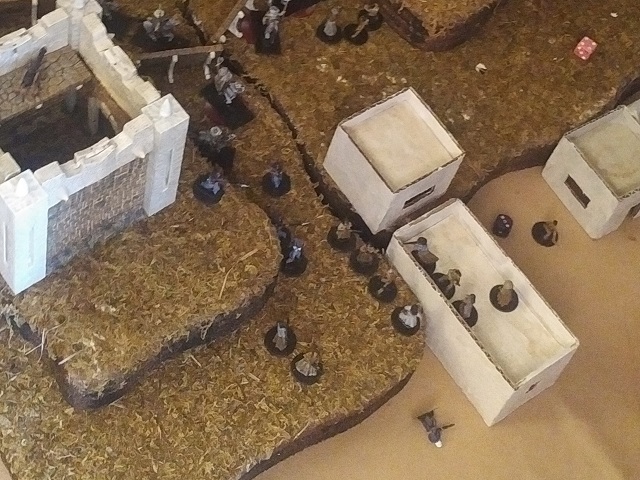 We've got a fort with some riflemen, and an artillery piece. The infantry has the same 50% hit, but a much lower Pk than the French. Their artillery works the same way, but again, is just less effective. 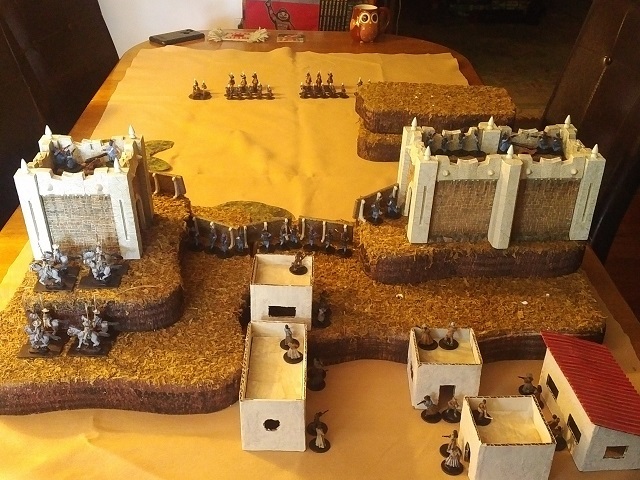 I have a wall between the forts, where it should really be a trench with some minor ramparts and castellations. 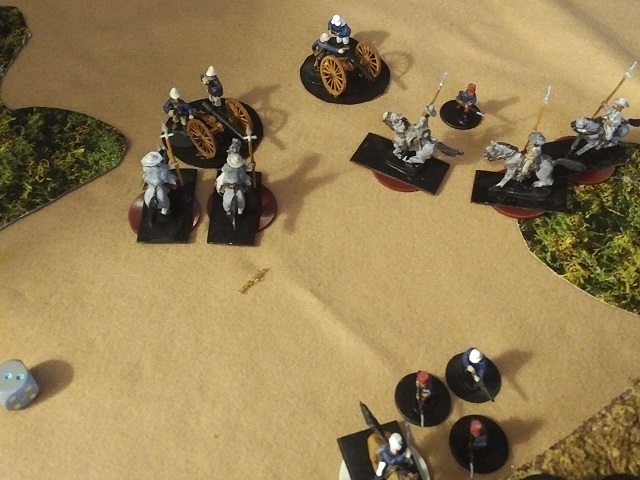 So while the terrain bit is tall, it can be transited by infantry and cavalry with just a small movement penalty. It does, however, provide good cover for the Mexicans, who, while their attack values are lower than the French, have better defense. Homefield advantage and fighting to save your country from invasion. And the other fort with just one artillery unit. Also, the Mexican calvary, the rurales, are hanging out on this side, behind the fort. They are slower than the French cavalry, but way more lethal and hard to kill. Then again, they are farmers. And if that wasn't enough to even the odds, we have the city of Puebla. Civilians - large numbers, but poor combat efficiency because they have pitchforks and hunting muskets. The Mexican civilians are also allowed to supplement artillery operations, but at the cost of two of them to replace one regular army. The citizens of Puebla have three three-sided dice (made by blanking out pips on a d6 so you don't have to do math while rolling). 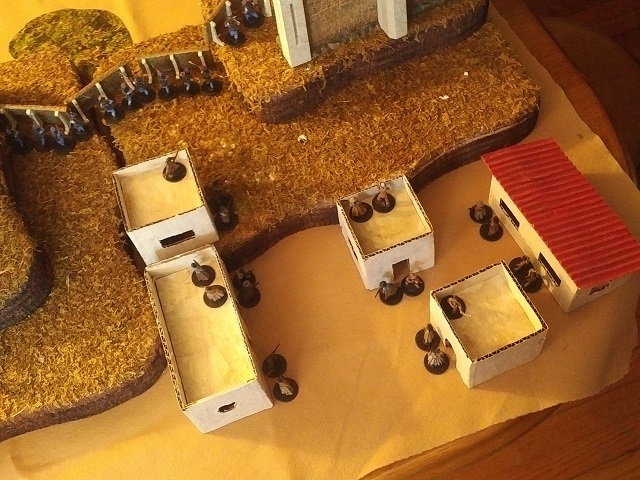 At the begining of the turn, if they roll less than the total Mexican army forces killed, they have been stirred into action and will join the battle. Otherwise, they stay put. This worked out well as we had a player join us a little late, just as the villagers were activated. So the French advance. Their left flank is doing a little oblique manuever. A few pot shots back and forth, including artillery, but not a lot of casualties yet. 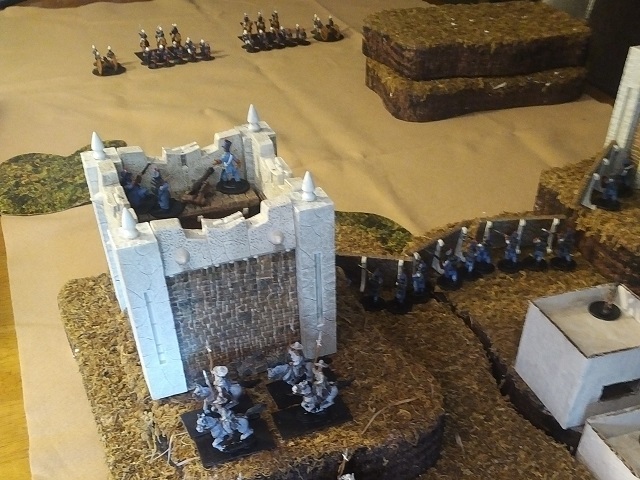 It will turn out that instead of bringing a full line up the hill to engage the entire fortification (what happened in the real battle), these French commanders have decided to concentrate on the Northern fort first. Now we've gotten into it. The French are coming right up the hill, taking a few losses. The Mexican army is dug in, but taking signficant losses. 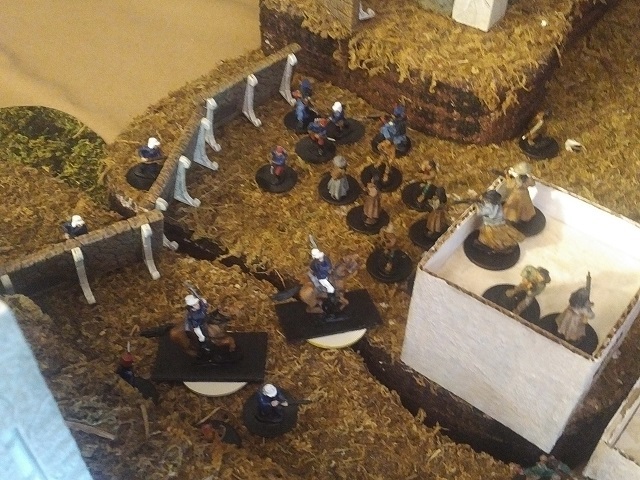 And, after waiting a few turns in the back, where they were protected, the rurales have swept down the side of the hill into the fray. 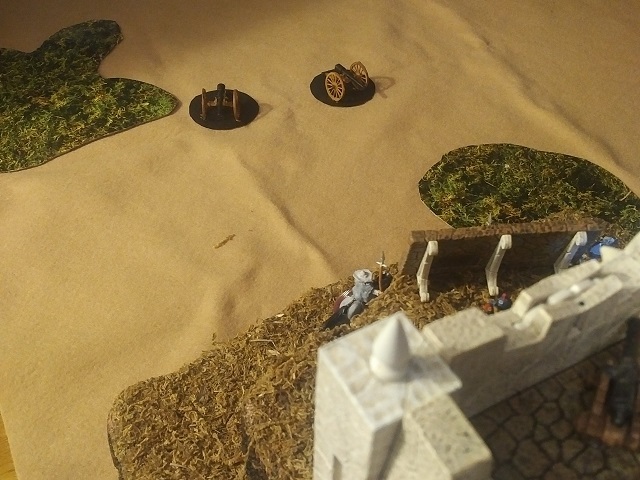 While the rurales did eat up a bit of the infantry, in a departure from the actual battle, they swept down to take out the last of the French artillery and limit the damage they were doing. This allowed the French to get all the way up the hill and breach the trench. Unfortunately for them, the Mexican army had taken enough damage to allow the townspeople to rally and support their side. 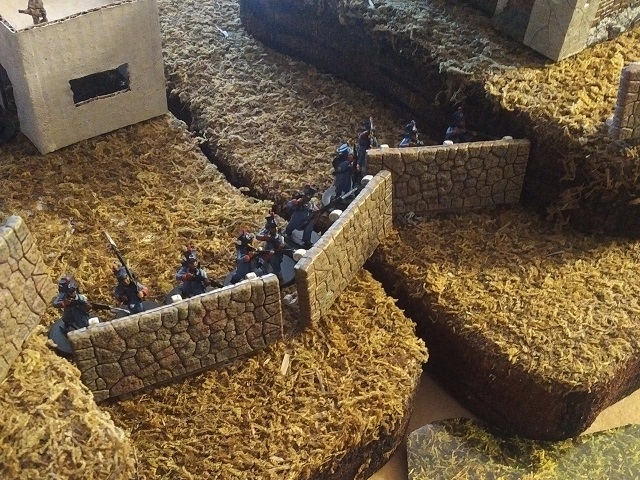 After cleaning up the French artillery (A player asked if the rurales could man the French cannon. I said, "farmers", and that discussion was over. ), the rurales turned around and went back uphill to sandwich the French forces. While they made an initial breach, the returning cavalry and villagers with pitchforks had picked up the slack from the depleted army. At the end of the day, the French were defeated. The Mexican victory laid squarely on the shoulders of farmers and civilians supporting the cause. So that was expected. 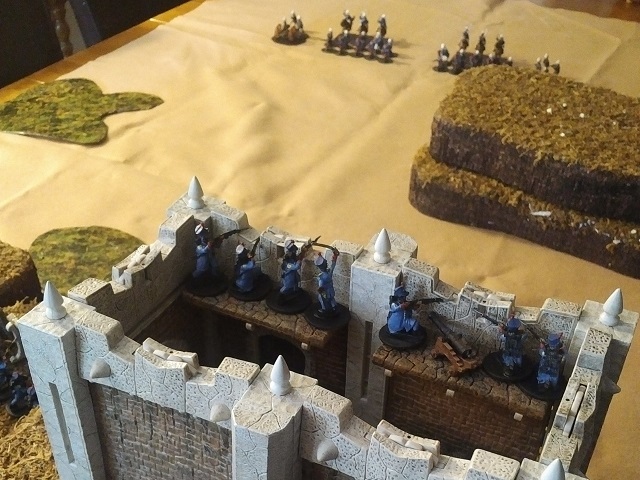 On the other side of things, the French did breach the Mexicans' defense and both Fort Loreto and Fort Guadalupe were abandoned, to get enough numbers to hold off the assault. 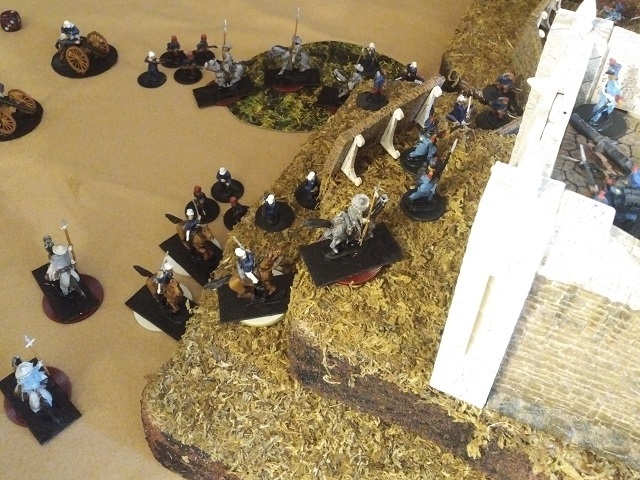 All in all, a good battle with some interesting strategic and tactcial turns while still preseving the spirit of the forces, times, and specific conflict. So, it's 1862 and Mexico is on it 50th government in the forty years since it won indpendence from Spain. Not really, but lots of governments in and out. Hard to tell how much real authority they had, and so it's also really hard to get a count. But lots of turn over. Back and forth. Regardless, the Liberal government (not my political statement, just what they called themselves) had just outsted the Catholic government (not my religious statement, just what they called themselves). They financed the coup by borrowing from England, France, and Spain. After their success, they instituted broad social reforms including (for the time) amazing health and social welfare programs which promptly ran the Liberal government broke. In months. Well, broke people have a tendency not to have money to pay off any loans they may have taken out. People who make loans and don't get paid back have a tendency to seek recitification. So England, France, and Spain sent a Joint Task Force to go see how much blood they could get from a stone. Massive austerity measures coming over the horizon. They landed in Veracruz, occupied it, and kicked the Mexican army back west to Orizaba. At this point, the Mexican government tried to renegotiate their loans. Spain and England bit. Lorencez, the French commander, had been told by Napoleon III that since that short Corsican dude had sold the Louisiana Purchase to the Americans, France hardly had squat left in the Western Hemisphere, so he was to repossess Mexico, not renegociate. So while the Spanish and English went home, the French kept marching west and kicking the Mexican army in the pants. Then around, say, May 5th, they come up to this spot called Puebla. Nice little town in a mountain valley right where the road turns north to go to Mexico city, protected by two forts (Loreto and Guadalupe) perched on two adjoining hills. Zaragosa and Juarez' forced had been beat down, kicked around, and otherwised pushed back. Of course, this was a mostly untrained force that was underpaid and undersupplied (lack of money, remember?) going up against the time's greatest battle-hardened national superpower army. So ... expected. Now that Lorencez has the Mexicans backed into a corner, he's ready to finish them off and march into the capital. His intelligence tells him that the Mexican people are tired of and disillusioned with their government and their army. Dead on right. Just like the last few decades, given the opportunity, they will help overthrow the current seated power. Well .. the only thing the Mexican people hated more than the Mexican government was "any bunch of stupid Europeans who come over here with their big hairdos bent on taking OUR money instead of giving your"  government to a decent bunch of Mexicans like ourselves. And while the army was (fighting valliantly) on its last legs, they had a secret weapon. So secret that they didn't event know they had it. They had rurales - a cavalry made of deputized farmers on plow horses with old, obsolete lances. There was probably one guy riding a cow. So the French army assaults. In the morning. During rain. Two waves go uphill to the forts. Two waves fall back. Now the third wave ... the final assault. We're beat down (and almost out of artillery since the other guys (and their logistics) bailed on us ... it's always logsitics, isn't it? ), but they're worse and the town is about to turn on the Mexican army. But not so much. The French grind up the muddy, bloody slope. Insted of revolting against their own army, the Mexican people show up at the forts and help their army against the revolting French. Then the rurales rode down the hill. Farmers on nags with big, pointy sticks rode into the face of the best trained and equipped army in the world, supplemented by the hardest, nasties mercenaries you could find. And they savaged their line! oh, yeah ... like a year later the French came back with a real army and took over the country, installing Maximilian as emperor of Mexico.